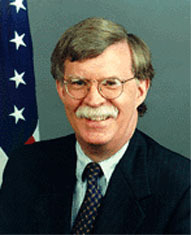 Known as Donald Rumsfeld's man in the State Department, milky-mustachioed John Bolton served as an assistant attorney general during the Reagan administration and assistant secretary of state under George H.W. Bush. Later, he wound up working as a staff lawyer for the GOP. During the 2000 Presidential election quagmire in Florida, Bush campaign strategist James Baker dispatched Bolton to Palm Beach to halt the recount, which he did. Bush tapped Bolton for Undersecretary of State, reporting to Colin Powell and later Condoleezza Rice. Before Bolton's confirmation hearings, Jesse Helms declared in January 2001: "John Bolton is the kind of man with whom I would want to stand at Armageddon, if it should be my lot to be on hand for what is forecast to be the final battle between good and evil in this world." The Senate confirmed him for the post, despite inconsistencies between views expressed in his testimony and some of his published essays. Unusual for a diplomat, Bolton is perfectly comfortable playing the Bad Cop role. In May 2002, he accused Fidel Castro of having a clandestine biowarfare program, even though his claim was immediately contradicted by American intelligence agencies. In July 2003, he called Kim Jong Il a "tyrannical rogue state leader" (which was true, of course). In 2005, Bolton was named as America's Ambassador to the United Nations. He has always been harshly critical of the U.N., and once said, "If the UN Secretary Building in New York lost 10 stories, it wouldn't make a bit of difference." As Undersecretary for Arms Control, Bolton personally signed the official letter telling the U.N. that the U.S. would have nothing to do with any International Criminal Court, and in a 1994 speech he said, "There's no such thing as the United Nations."